The Saw franchise is a rare breed indeed. Any horror movie that is moderately successful usually gets enough sequels to fill up a whole rack in Blockbuster. Friday the 13th, Halloween, Nightmare on Elm Street, Texas Chainsaw Massacre, all of those franchises started out strong and then were run straight into the ground by lackluster or downright lousy sequels, but Saw has managed to be entertaining through all five movies thanks to some clever stories, interesting twists, and a serial killer that we all love to hate. If you’ve been keeping up with this franchise, you already know that Jigsaw died in the third movie. If you haven’t, I apologize for ruining that for you, but you can’t talk about the new movie without discussing the previous ones. You’ll get over it. As the end of the fourth film showed, Detective Hoffman is now set to carry on Jigsaw’s legacy. This entry picks up precisely where part four left off with Agent Strahm locked in the room with the dead Jigsaw. He finds a way out, gets ambushed, and wakes up to find himself in a death trap. He survives and has reason to suspect Hoffman may be connected with the now deceased killer. Hoffman must finish off all loose ends, so while Strahm investigates the matter, Hoffman sets up one final game. Take a second and think of the popular horror franchises out there. Now think about their stories. I bet you can’t. The fact of the matter is that no matter how revered a franchise like Friday the 13th or Halloween may be within the horror community, they don’t have much in the way of their stories. That is why I’ve got to hand it to all of the writers that have contributed to the Saw films. They attempt to give us intriguing narratives filled with twists and turns that all somehow fit into the overall story arc and they mostly succeed. Still, they seem to be messing around with the formula a bit too much. The writers are taking a simple premise established in the first film—a dying man teaches those who don’t appreciate life how precious it is through self mutilation—and making it unnecessarily convoluted. This entry explores the relationship between Jigsaw and Detective Hoffman and how he came to be the killer’s apprentice. Therefore, the timeline jumps around a lot, but it doesn’t just jump around in the context of this film. It jumps around within all five of them. There are aspects taken all the way back from the first movie that are explored in this one that don’t seem prudent to what this picture is trying to accomplish. I actually found myself a little befuddled by the end. 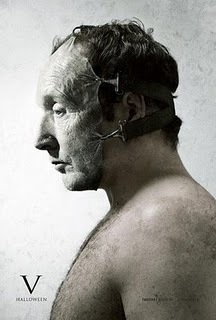 Last year, I walked out of Saw IV scratching my noggin and it happened again this year with Saw V.
In a way though, I welcome that confusion because if the film didn’t jump around through the whole franchise, Tobin Bell wouldn’t be in it. Bell is deliciously evil as the serial killer Jigsaw, but plays it perfectly cool, almost in a way that you kind of want to hang out with him. He puts people in death traps, but claims he has never killed anybody in his life. He always gives them a means to survive and in the process teaches them that they aren’t leading their lives the way they ought to. Although Jigsaw met his demise two movies ago, his inclusion is a necessity because there is no franchise without him. Despite its somewhat confusing story, I still had fun with this one. It’s probably the weakest of the five, the twist is underwhelming, the story is confusing, and it left plenty of questions on the table (to be answered in the inevitable Saw VI: Death of a Franchise), but the whole is greater than the sum of its parts. Saw V isn’t going to convert any non-fans over to the dark side, but it will provide enough blood, guts, and thrills to satiate those souls who’ve already been tainted.